This is a level 1 beginner crochet pattern. You will need to know how to chain, single crochet (SC) and double crochet (DC). All other steps (using two colors, seaming up) are explained. This pattern uses two colors for the leggings, and then a third, option color to adorn the top! I used multicolored wool yarn for one of my choices, and brown wool for the other. 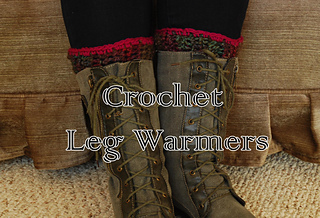 Download, and enjoy the snugly warmth of crochet leggings this fall!